Clothing/Jewelry Description A pink floral shirt and blue jeans. Medical Conditions Brittany suffers from severe asthma requiring medication. She doesn't have her medicine with her. 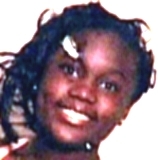 Brittany was last seen when her aunt dropped her off at her father's home on McCovery Road in Mobile, Alabama at 9:00 a.m. on June 14, 2012, for what was supposed to be a two-day visit. She has never been heard from again. Her father, Demetric L. Hooper, left Mobile immediately after her disappearance, and six weeks later a warrant was issued for his arrest. A photo of Hooper is posted with this case summary. In September, he was located at a mental health facility in Arkansas. Hooper suffers from schizophrenia and had sought treatment there. In the years prior to Brittany's disappearance, he had been hospitalized in Alabama several times for his mental illness and for drug problems. Brittany wasn't with her father when the police found him in Arkansas, and he was charged with felony custodial interference. Authorities determined he traveled extensively throughout the southeastern United States after Brittany vanished. He took a bus from Memphis, Tennessee to Arkansas on July 7, three weeks after Brittany was last seen, and she wasn't with him then. Searches of Hooper's home turned up no evidence of Brittany's whereabouts, and she hasn't had any contact with friends or relatives since she was last seen. She was supposed to begin her freshman year at Murphy High School in the fall of 2012, and had signed up for advanced placement courses. The circumstances of her disappearance are unclear. Updated 3 times since October 12, 2004. Last updated June 27, 2015; age-progression added.